As we enter the first month of 2007, the Mac and OS X still rule, and Microsoft still cranks out ugly versions of Windows, years late and full of bugs. It's a source of endless amusement for Mac purists - but not so funny if you need to use some specific Windows-only software. If you really need to run any flavour of Windows - with experimental support for Vista - without setting up the dual-boot system required to run Apple's Boot Camp, then Parallels Desktop is up to the job. If you've used Virtual PC, you'll find that Parallels Desktop provides similarly easy installation; our Parallels installation and even Windows installed without a hitch. 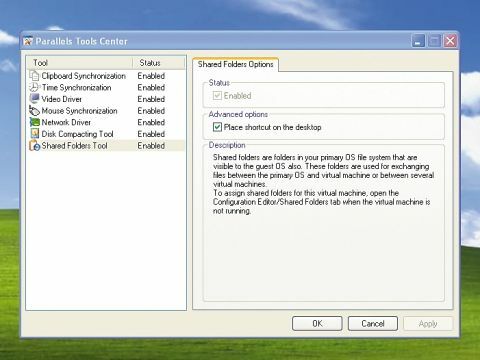 Unfortunately, however, Parallels also has VPC-like shortcomings in the video-emulation arena; hardware 3D acceleration isn't yet supported, so your high-spec games and CAD apps will suffer under Parallels. Parallels is a work in progress, unlike Virtual PC, which doesn't run on Intel-based Macs and is no longer being developed by Microsoft. Parallels recently added support for Apple's Mac Pro and Leopard. At press time, Parallels uses software virtualisation because the Mac Pro's hardware virtualisation (VT) is disabled in the firmware. Parallels reps say they're waiting for Apple to fix the problem. Parallels isn't multithreaded, so apps such as Photoshop are actually threading through only one of the Core 2 Duo's cores. Apple's Boot Camp beta offers better performance, but with less convenience: Parallels runs as an application on your Mac, while Boot Camp requires you to restart the Mac in pure Windows mode. Parallels is the better choice but only if you're not running the latest multithreaded Window's games or 3D graphics tools. Boot Camp is better if you do run those apps, or are working on a tight budget.